In previous posts, I have shared my view on important cornerstones for successful innovation management systems. As pointed out several times, balanced and up-to-date innovation management requires organizational ambidexterity, i.e. the capability to explore novel offerings and capabilities while simultaneously exploiting existing ones. In the following, I would like to summarize and complement these thoughts by suggesting an innovation management model that may help organizations to innovate more successfully and sustainably. This model condenses learnings and experiences of my work with diverse companies in various industries around managing innovation up to now. It aims to integrate objectives, activities, requirements and inherent tensions along the innovation spectrum as well as enabling aspects, often being discussed independently from each other. Therefore, it’s titled a model for integrative innovation management. In my view, sustainably successful innovation management systems in organizations are required to be based on a couple of essential premises – all of which can be considered necessary conditions. As successful innovation management also relies on additional factors, they are no sufficient conditions, though. Exploitation-oriented initiatives are related to running core business by executing and enhancing existing business models or technological capabilities. The primary direction of impact is value capturing (commercialization). Examples: Product, service or process innovation, portfolio extension, innovation of selected business model components (e.g. channel or operations), market research. Exploration-oriented initiatives are related to developing future business by searching for novel, and often disruptive, business models or technological capabilities. The primary direction of impact is value creation (configuration). Examples: Business model development, platform/ecosystem innovation, basic technology research & development, startup engagement, innovation intelligence. The target portfolio including new initiatives is derived from a strategic growth gap analysis. In order to fill an identified growth gap, a company needs to start exploitation- or exploration-oriented initiatives with corresponding sizes and time horizons. Premise 2: Senior management is committed to attributing equal importance to exploitation and exploration initiatives as both are vital for a company to thrive sustainably. This particularly implies receiving a long term mandate and adequate resource allocation for exploration and its initiatives. Probably the most critical requirement for explorative initiatives to flourish is staffing them with dedicated, high-quality full-time workers. Given that the vast majority of startups fail despite mobilizing dedication from a team that has nothing to lose, not dedicating adequate quality and quantity of workers will ultimately consign explorative ventures to failure. The appropriate ratio of resource allocation between exploitation and exploration depends on a company’s strategy and environment, among other criteria. The CEO is in charge to define this high-level ratio for the entire company. Does your CEO/executive management agree that innovation goes beyond breakthrough products to include business model innovation – entirely new ways to create, deliver, and capture value? Will your colleagues tell me that failure is a career-limiting move, or will they tell me that the company celebrates experimentation? How much time does your CEO/executive management spend strengthening and protecting the current business model, versus designing the next one? Does your CEO/executive management have clear and discrete objectives for both exploitative and explorative innovation? Do you organize differently for each? Do internal ideas and projects that threaten to cannibalize the current business model get squashed – or nurtured? Does your CEO/executive management have a process for allocating resources for explorative innovation projects that lies outside of the control of business units? Do executives with responsibility for explorative innovation report to the CEO/executive management, or to another line executive responsible for today’s business? Is your CEO/executive management willing to create a sandbox for exploration, even if it means carving out a part of the current business/market to serve as an ongoing real-world innovation lab? Note: It’s mandatory to receive CEO commitment and alignment among executive management before putting systematic effort in truly explorative activities – otherwise exploration-oriented innovation will eventually be doomed, resources be wasted and people be frustrated. Exploitation-oriented initiatives are anchored in the operational business units. Innovation governance is carried out by a business unit’s executive management as overall responsible and a dedicated innovation board as supporting structure. Funding is covered by the annual budgeting. Exploration-oriented initiatives are anchored in a dedicated exploration unit, headed by a “chief explorer” who reports to the CEO – just as the divisional leaders. He is also in charge for governance, supported by a dedicated “corporate innovation board” which is staffed by innovation-related stakeholders across the divisions. Financing is covered by a corporate fund, following a staged investment approach. In the end, this ambidextrous approach involves the highest impact on corporate development. Moreover, it avoids exploration to fall victim to common and dangerous organizational traits: short termism and resource prioritization in favor of core business. 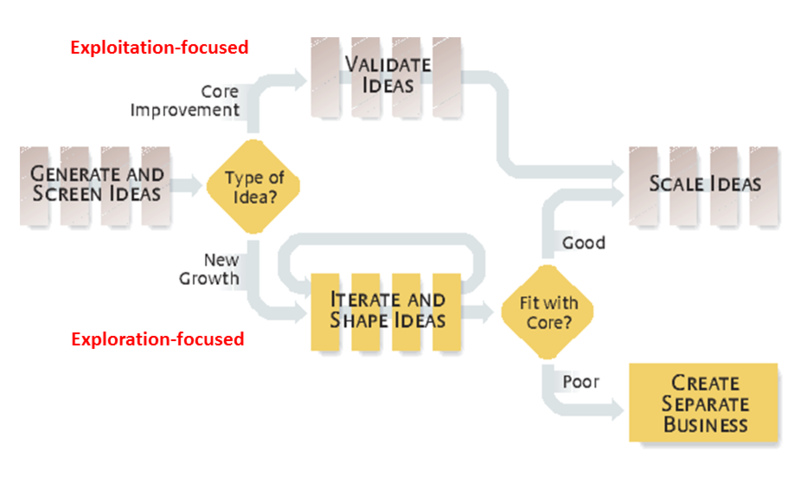 Premise 4: Fostering an innovation portfolio is enabled by a proper idea management system which allows to either assign an internal or external idea to the corresponding units or to reject it. One common mistake of organizations is to ask employees and external contributors to generate ideas without putting mechanisms in place to act upon them. Therefore, it proves crucial to develop criteria by which to judge and process ideas – particularly including the “crazy” ones. A good example of how an idea management process could look like, is given below. The original figure is slightly adapted for our context. Whereas the upper path is taken by exploitation-oriented ideas with high proximity to the core business, the lower path holds for exploration-oriented ideas with no (immediate) fit with the core business. In order to feed the idea management system with potent and explorative ideas, a company needs to be based on an open, collaborative culture, leveraging a cross-pollinating and serendipity-friendly infrastructure along with startup engagment. Moreover, each horizon is based on dedicated conditions in terms of accounting, metrics, approaches and instruments, as well as organizational and personal requirements. Upcoming posts will elaborate on this more in detail. In average, the ratio H1:H2:H3 for resource allocation amounts to be roughly 70:20:10. Although this might be a good rule of thumb, a company’s actually required ratio needs to be adjusted necessarily according to its individual context and environment. Existing H1 businesses are to be adapted and extended by partially renewing the existing business model or applying new technological capabilities (Adapt). H3 initiatives have been validated in terms of their success potential and are supposed to be scaled up. Scaling initiatives are intended to either end up as new H1 core businesses in case of disruptive innovation or getting integrated in an existing division in case of sustaining innovation (Scale). Depending on the type of environment a division operates in, either direction tends to be pronounced. If the environment is highly stable and malleable (e.g. offers a potential for disruption), deliberate, and occasionally revolutionary, opportunities from H3 will eventually enter H2. 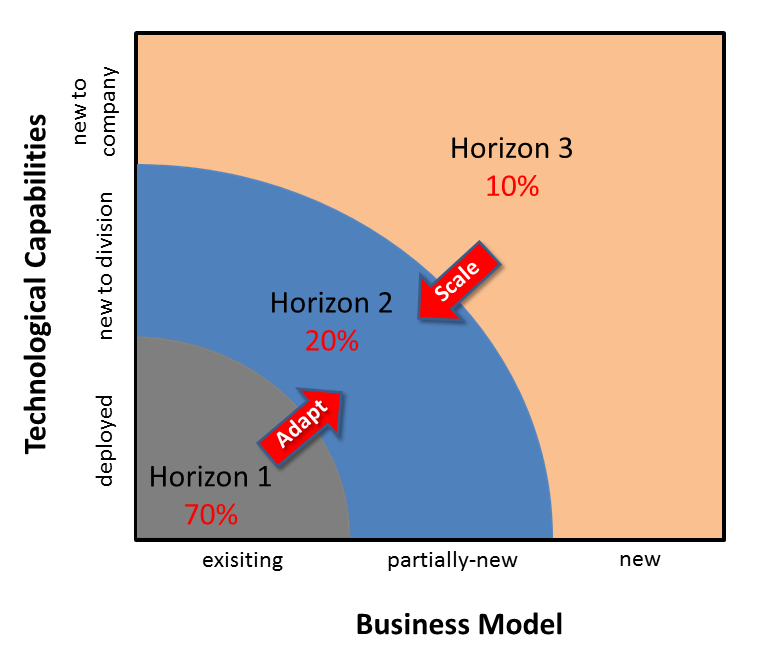 In case the environment is unpredictable and difficult to shape, a more evolutionary and agile approach is indicated: innovation is primarily operationally embedded and driven out of the core business towards H2, where experimentation within the existing business is leveraged to adapt to the changing conditions. In contrast, feeding from both directions is more balanced if the environment is in between those extremes. As most H2 initiatives pose a transformational character, usually coming along with significant organizational change and pain, it’s critical to launch as few of such initiatives as possible at the same time. Structural separation of exploration and exploitation is crucial for established companies in oder to pursue revolutionary innovation, i.e. to create novel businesses (e.g. through white space opportunities) and disrupt existing ones, mostly operating in mature industries, respectively. Prolongation of established businesses is accomplished through evolutionary innovation within existing business models. It requires integration of optimization and adaptation by means of an operationally embedded, agile organizational structure. Appropriate integration interfaces between exploration and exploitation structures have to be designed for collaborative scaling of initiatives and mutual capability leverage. Pursuing both complementary directions of impact in parallel entails a balanced innovation portfolio and therefore the highest likelihood for company success over the short and long term. Upcoming posts are planned to further elaborate on the three innovation playgrounds and their interplay. Stay tuned. My name is Leandro Bitetti and I am a researcher at the University of applied sciences and arts of southern Switzerland in the topic of innovation management. 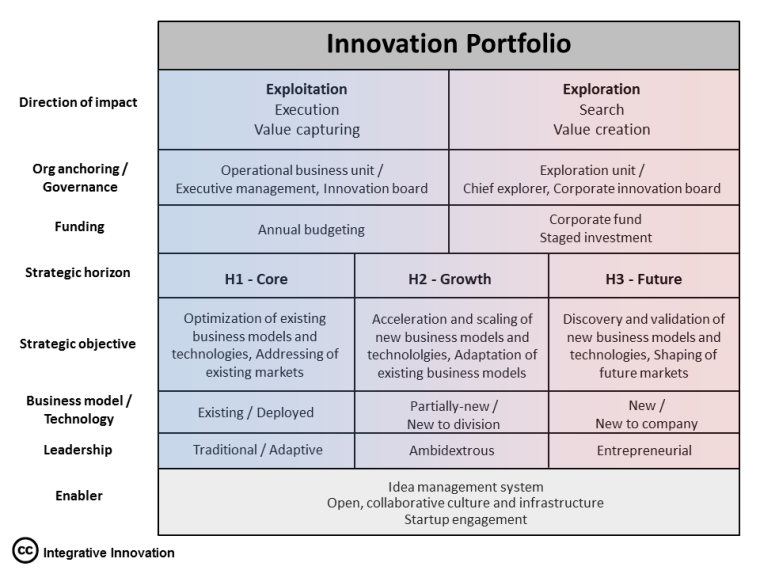 I really appreciate your posts and I see this one as a very nice and pragmatic operationalisation of the hbr article by Pisano (2015) “you need an innovation strategy”. For incumbent firms, we think that collaboration with fablabs and other comakership spaces are nice examples of temporary separate business units for exploration activities. You’re right – Pisano’s approach spanning the (explorative) innovation space by the two dimensions technology and business model definitely seems resonable to me. However, in terms of organizational implementation it seems too binary to me to just distinguish between old and new. That’s why I decided to split up the space into three three horizons – including an important “middle ground” H2. Collaboration with fablabs or other external initiatives may be reasonable examples for activities happening under the umbrella of an exploration unit. This unit is to incorporate all internal and external exploration activities (H3 = discovery and development of new technologies/biz models) of a company – such as co-creation spaces, incubators/accelerators, in-house labs, hackathons, CVC, outposts etc. Of course, there may also be cases, where such activities are leveraged to expand existing businesses – what I term as the “expand” path towards H2. This would then primarily be driven out of the existing business units – occasionally in collaboration with the exploration unit. Interesting to suggest the 3 types of management requirements. Usually it’s all about either exploration, or exploitation. But there is a hybrid too! I’d be curious to know if you have any insights on the type of performance metrics that would apply to each for the people work in each of the 3 spheres, and also how these metrics woud be applied. Thanks for stopping by, Bart! The innovation model condenses my experiences up to now attempts to link the dual “ambidexterity” to the “horizons” triple. I’ve been using and advovating both concepts for quite some time. The model is sort of unique in how the dual directions of impact become implemented across three playing fields, with the middleground functioning as an “interface”. I’m still working on how to properly implement the innovation management triple, including e.g. adequate metrics. Basically, used metrics have to reflect the desired outcome of the particular sphere, i.e. optimizing the existing core, scaling of businesses-to-be and exploring new opportunities. Thanks for the reply Ralph! Looking forward to those insights! Really good stuff — thanks for putting this out! A further idea I have used is a 3-axis approach with a cascade of strategies down one axis, alignment across functions, BU’s and geographies, and accountability operating from the Chief on down through the layers and networks. . The large pitfalls I have seen in the innovation system has not been a lack of good ideas, but rather incomplete carry-through on strategy, failure for functions, BUs or geographies to play their essential roles, and failures in accountability up and down the organization. The layers of strategy are critical to play out the entire thought process: Business Strategy, Product, Technology, Programs and Projects, Organization, Process, Tools and Methods, and Infrastructure, each being driven by its predecessors. I have seen many initiatives crash for failing to think through these layers. Oddly, or maybe not so oddly, the largest failures in accountability I’ve witnessed happen with decision-makers and senior leaders — as we go up, we become accustomed to spreading bets and minimizing risk, so putting ourselves on the line for the riskiest activities in the firm is often not in our remaining instincts. Innovation becomes a small thing rather than a great and grand thing where accountability is not strong. Anyway, marvelous stuff — keep grinding! Thanks for your Feedback and in-depth comment, David – much appreciated! It’s good to hear you supporting a portfolio strategy across three playing fields. I definitely agree with you on “carrying-through” or execution to be the major issue in order to bring innovations to market. It seems related to what we have recently coined “Scaling up” issue, i.e. transitioning an idea towards significant impact and economic success. This part of the process heavily relies on a proper interplay of distinct elements/functions in the innovation system. A major lever to be tapped to unlock potential.